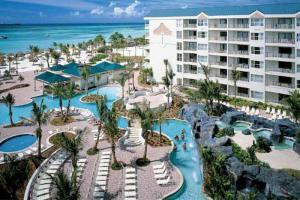 Set along the crystal-clear waters of the Caribbean Sea, Marriott's Aruba Ocean Club is a true paradise on Palm Beach. This upscale resort offers elegant guestrooms and villas with fully equipped kitchens and separate living and dining areas. Soak up the sun at the beach and the pool or enjoy a signature massage at Mandara Spa. The resort also features an array of dining options, including The Sands Eatery for fresh, local cuisine and Champions Sports Bar.